As you probably know, there’s a whole lot of great things about cannabidiol (CBD). This powerful compound is a cannabinoid, in this case coming from the hemp plant. (And put into Mishka’s delicious CBD baked goods!) Cannabinoids work with your body’s endocannabinoid system (ECS) in a similar way as its naturally occurring endocannabinoids to treat a wide range of conditions, and CBD is one of the most medically effective ones out there. But in addition to being a medical powerhouse, CBD is also a whole lot more fun than a bottle of pills. For one thing, we can eat it! And at Mishka we’re celebrating that unique and joyful aspect with a line of CBD edibles that are as tasty as they are thoughtful. 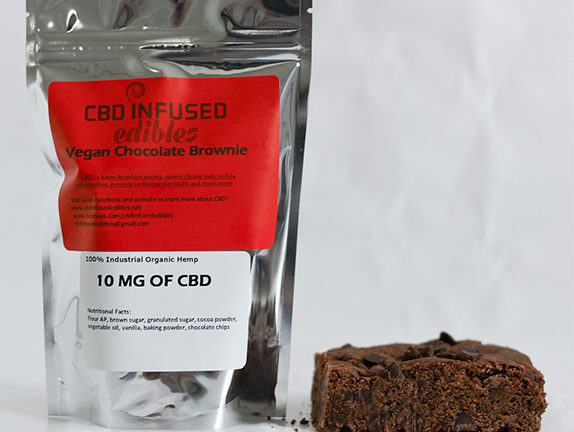 Firstly, we’ve capitalized on the fact that chocolate helps boost the power of your ECS; including it in all three of our CBD bakery options. Secondly, we’ve hacked into the influence of essential fatty acids, which help the ECS function at its best. You’ll find it in all three of our CBD baked goods as MCT oil, which our hemp is dissolved in before it gets your tasty treats; and you’ll also get a bonus effect via the coconut in our Coconut Chocolate Chip cookies, which are gluten-free too! We’ve also kept vegans in mind with our Vegan Chocolate Brownie – and both of these allergy-friendly options don’t compromise a single morsel of taste. And, of course, our classic Double Chocolate Chip Cookies are another big crowd-pleaser. All the choices we offer at Mishka are created from organic industrial hemp that’s grown and extracted under the strict guidelines of the Kentucky Department of Agricultural Industrial Hemp Pilot Program. CBD first gained wide recognition for treating epilepsy and seizure disorders, especially in children. It’s particularly advantageous as it allows people to access the powerful medicinal effects of cannabis without creating the psychoactive set of effects known as “being high.” Though CBD will have an effect on your mental state, it’s one that is calming without the user experiencing any major alterations in perception – other than a better mood! This completely non-psychoactive cannabinoid doesn’t directly trigger ECS receptors, but insteads modifies their function; positively affecting your ECS in a multitude of ways. When employed, CBD has a large role in the ECS by influencing other types of receptors while also occupying certain enzymes, which enhances one’s natural levels of endocannabinoids. CBD has been shown to help a multitude of conditions, but is mostly commonly used for epilepsy, anxiety, pain, inflammation, PTSD, Crohn’s disease, multiple sclerosis, and insomnia. It can also improve basic functions, like providing better mental clarity, improved muscle recovery, clarifying skin, and improving focus. And you can access all this medical force simply by eating a cookie! What a wonderful world. Mishka was created by our fearless leader, Stella, after working in medicine for nearly a decade. She’s now channeled her passion for natural health into the amazing line of CBD products you see on this site, like these scrumptious baked goods. Her goal was to make consuming CBD oil simple and enjoyable as well as eliminating the guesswork when it comes to portioning – and the feedback we receive (including from Chicago Magazine!) concludes that she’s wildy succeeded. Reap the benefits of her work and start enjoying our CBD-infused edibles today.